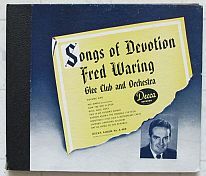 Here is an album of three double sided 78 RPM records by Fred Waring. The records are in good condition with only minor surface scuff marks and scratches. The center holes are in very good condition with no chips. The album cover is in fair to good condition with only a few minor tears and scuffs along the edges and corners. The spine is fair to good condition with some scuffing and a tear on the bottom. "Ave Maria" and "Now the Day is Over"